Visual Studio Code>Other>edlinNew to Visual Studio Code? Get it now. This extension will help to edit line, so it is edlin. Select the text / line at first. Or use Command Pallete (some only work here, e.g. Index From). Choose the function you wanna! only allow number index and in format: "1. " Context menu for all edline function above. 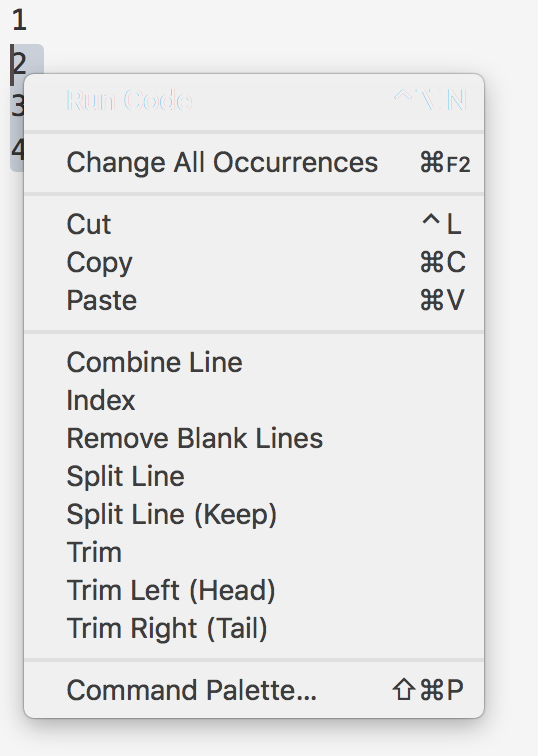 [0.1.0] (fixed) MacOS can not use the trim function. [0.0.2] (fixed) Can not remove blank line in some file. It comes from the wrong splitor. May see the catalog for details. [0.5.0] Add wrap(using $1 like regex). [0.3.0] Add command category for convenience; Add a simple index function. [0.2.0] Update the support of Windows, Unix, and MacOS. [0.1.0] Support Windows, Unix, and MacOS now. [0.0.1] Initial release of edlin. Source code in Github under MIT Lisence.